To build the Addition project, the Washington State Convention Center (WSCC) requested that the City vacate three alleys and underground portions of Olive Way and Terry Avenue. In exchange, WSCC is paying full market value of that land as well as providing a package of investments for the community. The value of these investments totals more than $93 million and includes substantial funding for affordable housing, parks and open spaces, improvements to Pike and Pine between downtown and Capitol Hill, bicycle infrastructure, a lid I-5 study, and more. Seattle City Council approved the convention center’s request in May 2018. Since then, more than $42 million has already been conveyed to the relevant organizations and government agencies. To learn more, view the chart below for specific information on the package of community investments, and explore a summary presentation of the benefits HERE. Over the course of three years, WSCC conducted an extensive stakeholder outreach program, including participating in more than one hundred meetings with neighbors and community groups and hosting two community open houses. Along the way, WSCC came to an agreement with the Community Package Coalition – a group of local civic, non-profit and advocacy organizations – on a set of community benefits. Members include Capitol Hill Housing, Cascade Bicycle Club, Central Seattle Greenways, First Hill Improvement Association, Housing Development Consortium, Freeway Park Association, Lid I-5, and Seattle Neighborhood Greenways. These Community Package Coalition benefits are outlined in the matrix above. In addition to direct community investments as part of the alley and street vacations process, WSCC agreed to a Project Labor Agreement with the construction trades, will adhere to Seattle and King County priority hire regulations, set an $80 million WMBE contracting goal, and is partnering with UNITE HERE to create a hospitality job training program. More information on the jobs training program is available HERE. 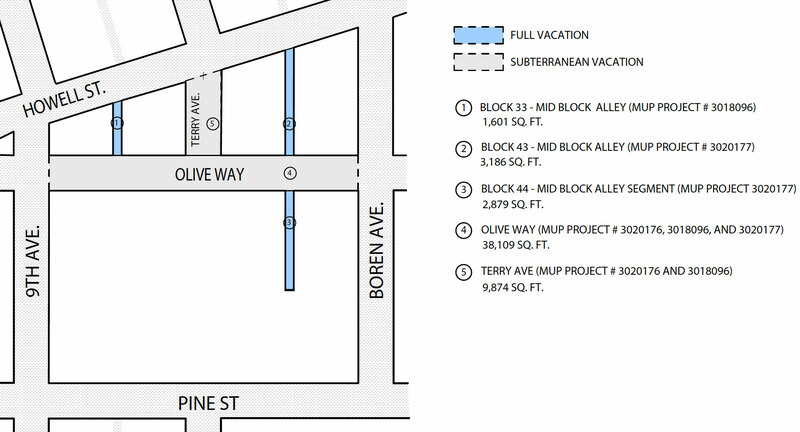 How are street and alley vacations for the Addition different than typical projects? With typical development projects, proceeds benefit the owner. In this case, the WSCC is a Public Facilities District, a non-profit with a public purpose to bring economic benefits to the community. The City’s adopted street vacation policies say that the public nature of a project is a factor that will be considered in making vacation decisions, and that the public benefit should balance what the public loses through the vacation with what the public will gain from the project. The project itself gains little development area from the vacations. The main benefit to the project of the vacations is the ability to locate the exhibit hall and loading dock below grade. This creates a successful convention center in an urban setting without compromising the pedestrian experience with too much bulk at street level, a major benefit to the public. In addition, the project is rebuilding utilities, surfaces, sidewalks, and landscaping. Therefore, the Addition’s benefits do not begin and end with the community investments package – rather, they will continue in the form of additional tax revenues, thousands of permanent jobs, millions in annual visitor spending, as well as the utter transformation of the equivalent of four entire city blocks. The project will pay the City a fair market price for the value of the land. In addition, the project is providing a package of community investments for the general public in exchange for the loss of the rights of way. The investments total more than $93 million and include substantial funding for affordable housing, parks and open spaces, improvements to Pike and Pine between downtown and Capitol Hill, bicycle infrastructure, a lid I-5 study, and more.